These are the brushes that I use the most. A mixture of sizes and make. My latest acquisition is a thin line size4 Raphael, recommended by Billy Showel as being very good for creating fine lines and yes it is brilliant. I have just discovered the wonderful brushes made by Ken Bromley. I have achieved remarkable results with these brushes. I recommend them! 1st Question : How do I get expansive brushes that I do not buy.Well if you are wise enough to wait for special offers, they arrive. 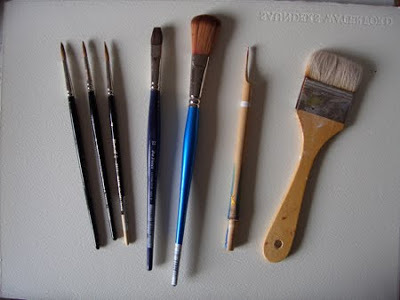 Watch for adverts who say : buy so many watercolours etc... and we give you a free brush ! But beware, make sure that the brush is a good quality one otherwise it is not worse it.I use the Da Vinci flat one quite a lot for flat washes or even creating texture for trees.The large blue one is used occasionally for a wet in wet wash.The hake must be used very lightly, no pressure on the paper otherwise it does not work. It is used with a lot of water not dried for best results.My bamboo stick is great for creating lines while my paint is still wet on the paper. 2nd Question : How do I care for my brushes ? After each session wash them with soft soap, rinse well, lay them flat on tissue paper.Store your paintbrushes away from moth. They love the hair.You can buy a sealed tube to keep them in but make sure that they are perfectly dried before doing so.